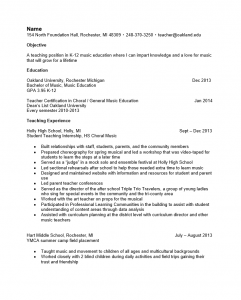 The Music Teacher Resume Template provides a job seeker with a way to give a complete overview of their qualifications. Being a music teacher can be a fun but challenging position especially since many students will pursue music as a result of some very personal reasons. Music teachers will need to have a substantial amount of technical knowledge, an understanding of psychology, experience, and an ability to both control and communicate with large bands effectively. In addition, music teachers are often responsible for actual performances put on by a school which can often lead to many high pressure situations requiring excellent problem solving techniques. This means that in a resume, a music teacher must truly sound fantastic. A well-orchestrated resume can achieve this end so that one can score an in-person interview. 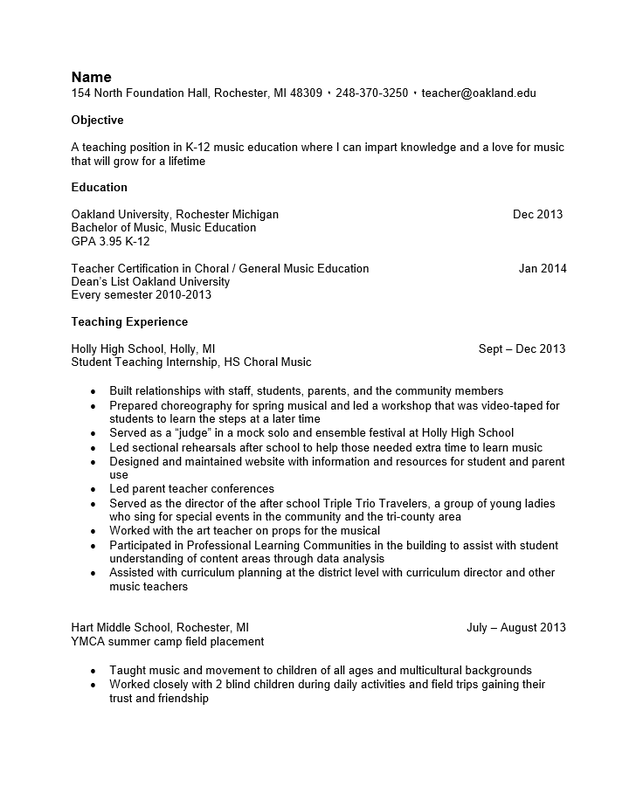 This is where the music teacher resume template can be very useful. By delivering a set format to a job seeker, it acts as a structural guide on where and how to present his or her information. In addition, once filled out properly, one can improvise their job search by revising their resume on the fly relatively quickly giving each inquiry the edge it needs. One’s chances for attaining an interview greatly increases if he or she can present a high quality resume that resonates with the position they are applying for relatively soon after a listing has been posted. Step 1. Place your name at the top of the page followed by your contact information. Step 2. The Objective Section. This is a declaration of your intention to apply for a specific position. That is, what is it you want from the recruiter. Step 3. The Education Section. This is where you will list your academic credentials. Obviously, for any teaching position this is imperative to make known. The minimum to report here is the school you studied in, the location, the graduation date, and your major or degree. Superfluous (and impressive!) information goes directly below this. Step 4. The Teaching Experience Section. This is a list of your previous employments in reverse chronological order. Each employment history entry should contain the name of the school you taught in, the location, the date range you taught there, the position you held, and a list of duties and achievements you accomplished there. Step 5. The Memberships Section. This section is where you will list any organizations or networking clubs you may belong to. This is not a section to list social media. That may go in your contact information if desired. Step 6. The Skills Section. This is a place to input any skills you possess relevant to the position and not overtly mentioned earlier in the resume. Step 7. Professional Development. This is where you should list any workshops or certificates you earned in addition to any degrees you mentioned earlier in the resume. Step 8. The Activities Section. List any extracurricular activities you participate in or run that has a direct bearing to the position being applied for. Step 9. The Philosophy Section. Optional. If you believe that directly writing about your philosophy in regards to teaching music will aid the professional tone a recruiter seeks then place this here. It should be a minimum of two sentences and should not exceed five.